Home Other Articles Solar Energy: What Is Solar Energy? Solar energy, radiant light and heat from the sun has been harnessed by humans since ancient times using a range of ever-evolving technologies. 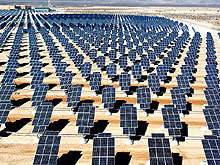 Solar radiation, along with secondary solar-powered resources such as wind and wave power, hydroelectricity and biomass, account for most of the available renewable energy on earth. Only a minuscule fraction of the available solar energy is used. If we can leave behind the public wave of denial in the realness of climate change and global warming, as caused by us, people, solar will be increasingly important in future lives as a clean, renewable energy. At present, the most common means of harnessing solar power is the utilization of a system involving a series of solar panels and storage batteries. The panels collect the radiant light and store the captured energy in the batteries. While energy is stored, it can also be used real time to operate various types of machinery and home appliances. The excess is stored for use at night or in other situations where radiant light is not readily available for some reason.